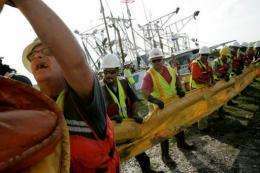 Workers unload oil boom lines to be laid by local fishermen in May 2010 in Hopedale, Louisiana. Oil giant BP said Wednesday it has finalized a $7.8 billion deal to settle thousands of claims from fishermen and others affected by the 2010 Gulf of Mexico oil spill. Oil giant BP said Wednesday it has finalized a $7.8 billion deal to settle thousands of claims from fishermen and others affected by the 2010 Gulf of Mexico oil spill. The settlement, which must still be approved by a judge, will resolve the "substantial majority of eligible private economic loss and medical claims stemming from the Deepwater Horizon accident and oil spill," BP said in a statement. It does not affect what is anticipated to be tens of billions of dollars in fines and claims from the US government, coastal states and local governments impacted by the spill. Nor does it resolve suits filed by shareholders or others seeking compensation because of a drilling moratorium imposed after the worst environmental disaster in US history. But it does resolve a big piece of a very complicated legal battle. "This settlement demonstrates BP's continued progress in resolving significant issues related to the Deepwater Horizon accident," BP chief executive Bob Dudley said. 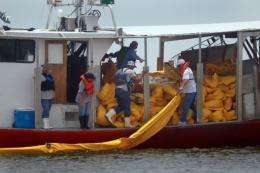 Fishermen use their shrimp boat to place oil booms into the water in an effort to protect the coast line from the massive oil spill in May 2010 near Shell Beach, Louisiana. Oil giant BP said Wednesday it has finalized a $7.8 billion deal to settle thousands of claims from fishermen and others affected by the 2010 Gulf of Mexico oil spill. "BP made a commitment to help economic and environmental restoration efforts in the Gulf coast, and this settlement provides the framework for us to continue delivering on that promise, offering those affected full and fair compensation, without waiting for the outcome of a lengthy trial process." BP said the settlement is not expected to result in any increase of the $37.2 billion charge it posted to cover the cost of the massive spill which blackened beaches in five US states and devastated the Gulf Coast's tourism and fishing industries. The April 20, 2010 explosion on the BP-leased Deepwater Horizon drilling rig killed 11 workers off the coast of Louisiana. It took 87 days to cap BP's runaway well 5,000 feet (1,500 meters) below the water surface as it spewed some 4.9 million barrels (206 million gallons) of oil into the Gulf of Mexico. The initial settlement was announced two days before the blockbuster trial was set to begin in New Orleans and is expected to result in a lengthy delay. BP said Wednesday it has asked the court to adjourn the trial until after Judge Carl Barbier grants final approval to the settlement following fairness hearings. The case will likely still go to court even if BP uses the extra time to reach a deal with the federal government. That's because the British energy giant is hoping to shift some of the cost to its subcontractors, a complex legal question which will likely end up taking years and multiple appeals to resolve. Barbier -- an expert in maritime law charged with consolidating hundreds of spill-related lawsuits into the single case -- has left the door open to some shared liability in key pre-trial rulings. Several government probes have already castigated BP, rig operator Transocean and Halliburton -- which was responsible for the well's faulty cement job -- for cutting corners and missing crucial warning signs.